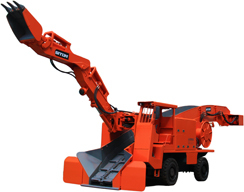 The former of mucking loader is collecting arm-type loader. After the technology was introduced from Sweden in 1980s, it was mainly used in railway and water diversion tunnel construction. The company has developed different kinds of loaders many times and updated them to adapt to different working conditions including section from 1.8 × 1.8m to 9 × 9 m (H × W), slope within 30º. Since it was widely used in recent years, it has become an alternative of the old scraper type rock loader. Tunneling Program Solution 1: Full-hydraulic drill jumbo +mining mucking loader + shuttle mining car (group) + belt elevating conveyor +multi-mining trolley + locomotive. Inclined roadway, especially inclined roadway with large inclination is always bottle neck for mine and non-mine main tunnel. There is no ideal equipment for loading gangue, which limits excavating speed. In the past, load gangue was loaded through traditional crawler loader or manually. Traditional crawler loader has disadvantages such as low efficiency, uncompleted slagging and impossibility to rake because of much water in the tunnel. 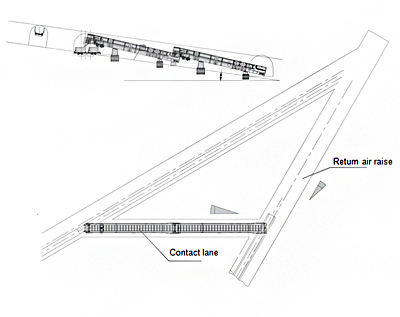 This program is applicable to long roadway and slope< 20º. Mucking loader (special for large slope) is used to excavate and pick up slag. Then slag is loaded through second transportation belt and transported through main belt conveyor. When blasting, the double-purpose belt is pulled up against traction winch on the ground. When placing material cars, second transportation belt is against the rear part of mining mucking loader. This program is mainly used for permanent belt laid at one time and roadways on permanent rail. It has advantages such as quick and continuous withdrawal of slag. 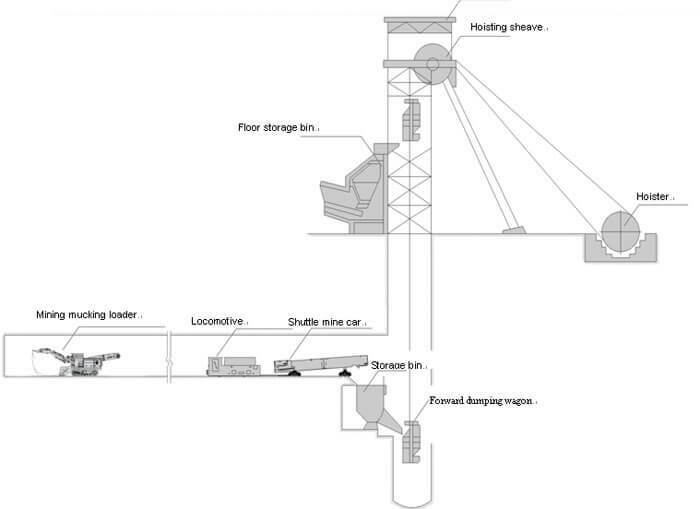 Shuttle Mining Car is arranged in the contract lane of a downhill lane and a gangway and is usually used for buffering gangues when the downhill lane is tunneled. In the tunneling process without the buffering of the Shuttle Mining Cars, the front tunneling is usually discontinuous, and the slagging is restricted; and the tunneling is restricted by the delayed slagging. 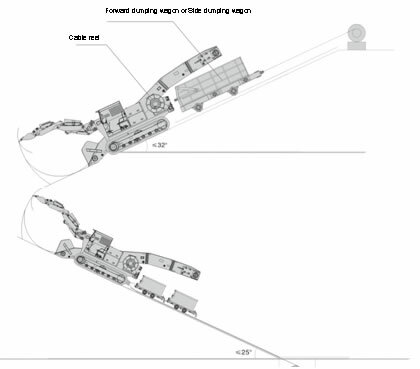 The main tunnel is developed under the vertical shaft; the shuttle mining car matched with the mucking loader is adopted in the gangway; after the shuttle mining cars unload the slag into the forward dumping wagon, the forward dumping wagon is lifted. By the reasonable matching, the working efficiency is improved while the mechanized operation level is promoted.